At the 9th Wood Plastic Composite conference, a solid profile was produced during the first presentation of the new fiberex 114 parallel twin-screw extruder. The machine manufacturer and main sponsor of the conference organized by Applied Market Information Ltd., UK had invited visitors to witness the live demonstration in its technical lab. 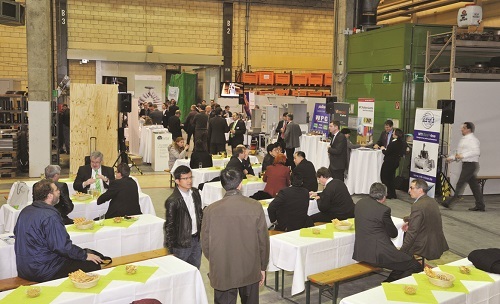 In addition to the extrusion line demonstration, the host staged a small exhibition, company tours and provided ample time and scope for personal expert discussions. Again this year, the AMI WPC conference was well frequented. 145 visitors from a total of 29 countries made use of this international convention to gather information about the latest developments and trends. The topics included a market overview as well as latest trends in materials and applications and ongoing changes in machinery and process technology. Decking is and remains the number one among applications for WPC profiles in Europe. Last year, the WPC quality seal was introduced, which gave an extra boost to a market already showing an annual growth rate of 20 to 25%. A new trend has emerged in the products themselves, to the effect that the demand for solid WPC profiles has increased by some 20% over the last three years at the expense of hollow profiles, which were mainly used previously. This is due to the specific advantages of solid profiles. In contrast to hollow profiles, solid profiles can also be cut diagonally and require no injection-molded edge covers for laying. Since they show even greater similarity to the natural alternative of solid wood, they can also be marketed via the same distribution channels. In production, the solid profiles score by more convenient embossing attributes, no need for complex calibration and tolerance for a higher regrind content. Due to changes in market trends and the rising demand for solid profiles, it was only natural for the WPC processing pioneer battenfeld-cincinnati to develop a custom-made extruder for this purpose and present it directly to the international public in full production. To manufacture the solid profile during the demonstration, a material supplied by the Belgian company Beologic n.v. from Sint-Denijs was used, consisting of 50% PVC and 50% wood fiber. A profile with a width of 160 mm and thickness of 25 mm was produced with an output of about 500 kg/h, at a line speed of 1.6 m/min. Thanks to its special process technology, the extruder provided excellent process stability in addition to high output. The die, as well as the calibration unit and an active haul-off device, came from Greiner Tech.Profile GmbH, Pettenbach, Austria. All other downstream components were supplied by battenfeld-cincinnati and functioned with customary low energy consumption and high efficiency. Further partner companies supporting the demonstration were EMDE with a spiral conveyor, Brabender with a gravimetric metering device, Woywood with a masterbatch dosing unit, and W&R Plastics, which supplied the masterbatch.